The Founder of Savoy. — The town of Savoy, which was founded in 1872, derived its classic name from its founder, William Louis Marshall Savoy, better known as Colonel William Savoy. He was born in Mississippi in 1818, and received a liberal education including training in modern languages which he later developed in practical use. 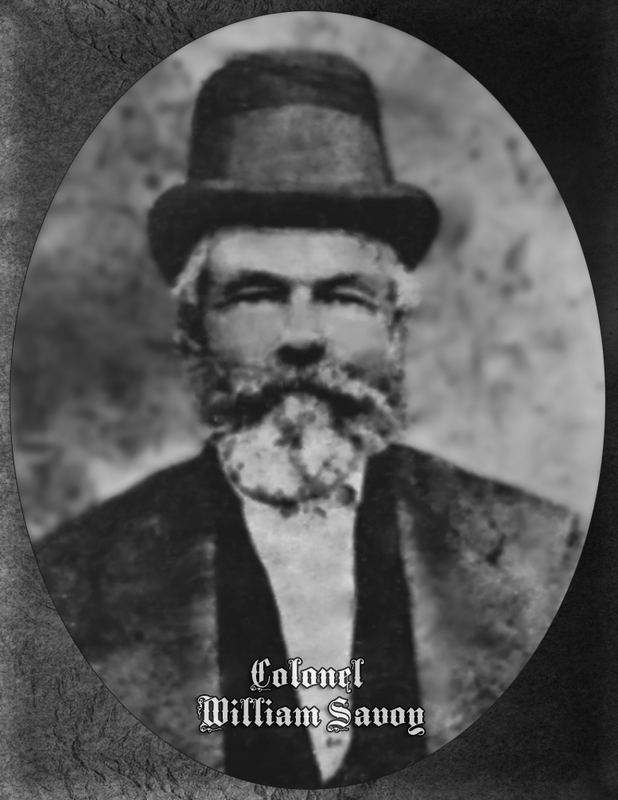 Colonel Savoy came to Texas when he was a very young man and settled at Sweet Home, Near Yoakum, on what is yet known as the Savoy Plantation. Colonel Savoy was ever of an adventurous spirit. 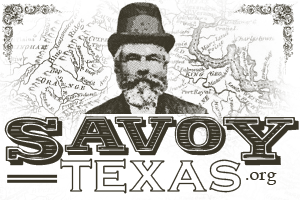 In 1849 he joined the crowd in the California gold rush, making the trip by water. There in the gold-laden hills he dug with pick and shovel and brought back to Texas golden nuggets in a heavy cotton bag. During the Civil War Colonel Savoy enlisted in the Confederate Army, but in training he received an injury to his foot which kept him out of active service. For the next few years he travelled widely, crossing the Atlantic twice and the Pacific three times. His daughter, Mrs. Ada Savoy Travis, thinks this traveling was in the Government Secret Service. She recalls that her father related many of his experiences to her when she was but a small child. He told her that he had had every contagious disease but yellow fever and once when he was in Central America he learned that yellow fever was raging; so he left hurriedly-even without his hat. He also left four hundred acres of rich land, but never went back to reclaim it. It was about 1870 that Colonel Savoy moved to Fannin County. He took up a grant of land–about 3,600 acres–that Mr. William R. Smith was about to lose. A deed filed in Bonham, on October 29, 1872, shows that he gave to the Transcontinental Railroad (now the Texas and Pacific) forty acres, twenty on wach side of the track, probably a concession to have the town named for him. Part of this is the site on which the Savoy Depot was built. He also gave the road right-of-way grants through his land extending almost to Bells, two miles away. On April 15, 1873, the charter for the city was filed. Deed records show that many of Colonel Savoy’s town lots were sold for $150, $300, and some for $500. He donated the lot upon which the Methodist Episcopal Church was built.